Cool! 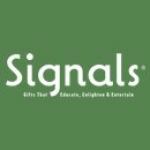 Save an average of 20% on Signals with 42 Coupon Codes, and 8 Deals! Signals is the online destination for those looking for gifts such as Books, Jewelry, Children's Toys and Apparel for the whole family. Details: Get Free "RUSH" shipping upgrade for Valentines Day. Be sure to enter code at checkout, and also choose "rush" shipping as your option. This is not FREE shipping, but free upgrade to RUSH shipping. Expires on 02/05/2014. Details: Additional 20% off clearance items. Expires 12/15/13. Details: 12% Discount Today Only! Details: Free shipping on all jewelry. Valid only 12/12/13. Details: Get Extra 20% Off clearance items. Expires 3/1/14. $19.99 flat ship rate gets your order delivered by 12/24/13. expires on 12/23/2013. Details: $19.99 Flat Ship rate gets your order delivered by 12/24/13. Expires on 12/23/2013. Details: Use coupon code OUTLET12 at checkout and save an additional 20% off of items in our online Outlet Store. Applies ONLY to Outlet Store items currently in-stock on Signals.com. Valid through April 1, 2012 or while supplies last. Online orders only. Details: 20% off orders of $75+. Expires 12/29/13. Details: 20% off OUTLET section prices. Exp. April 1, 2011. Details: $4.99 shipping on orders of $50 or more. Expires 12/8/13. Details: Get an additional 20% off clearance items. Expires 1/26/14. avail discount on select items today. Details: Avail discount on select items today. Details: Use coupon code 75SHIP and receive free standard shipping on orders with a merchandise total of $75.00 or more through April 8, 2012. Additional charges for heavy items or delivery outside the continental U.S. still apply. Details: Discount applies only to eligible items in our online Outlet Store. Look for 20% Off icons on eligible items. You must use coupon code FALL20 at checkout to recieve your discount. Discount valid for internet orders only and cannot be applied to previous orders or out-of-stock items. Discount is not valid for gift certificates or club memberships. 20% discount is in addition any existing sale price. Sale ends at 11:59 p.m. E.D.T. Oct. 14, 2011.